A heat wave scorched the eastern United States in early July 2010, straining power grids, slowing transit, forcing nursing homes to evacuate, and prompting East Coast residents to shelter in “cooling centers,” according to news reports. Temperatures topped 105 degrees Fahrenheit (41 degrees Celsius) in Baltimore for two consecutive days. The U.S. heat wave was echoed in several places around the globe. Beijing also experienced near-record heat, and temperatures soared to 122 degrees Fahrenheit (50 degrees Celsius) in Kuwait. This global map shows temperature anomalies for July 4–11, 2010, compared to temperatures for the same dates from 2000 to 2008. 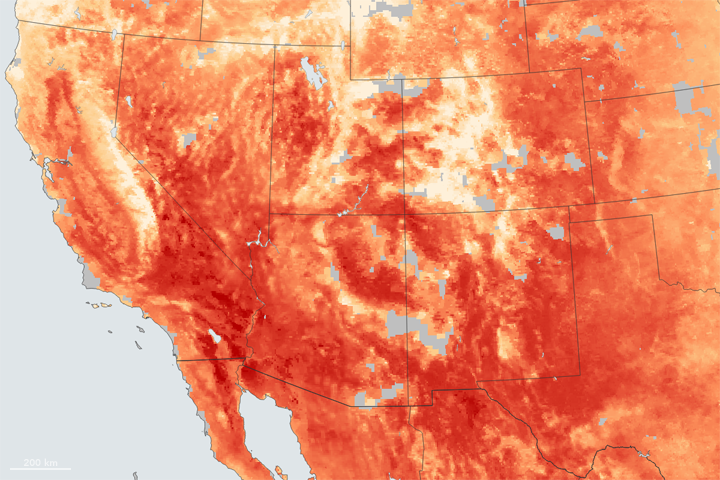 The anomalies are based on land surface temperatures observed by the Moderate Resolution Imaging Spectroradiometer (MODIS) on NASA’s Terra satellite. 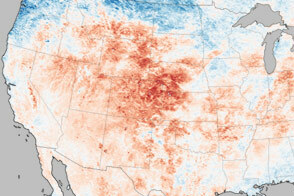 Areas with above-average temperatures appear in red and orange, and areas with below-average temperatures appear in shades of blue. Oceans, lakes, and areas with insufficient data (usually because of persistent clouds) appear in gray. 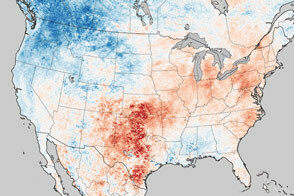 A bright red swath runs down the east coast of North America. Warm temperatures also occur in western Canada, parts of Western Europe, Siberia, and eastern China. The most conspicuous patch of above-average temperatures appears north of the Caspian Sea. Not all areas are gripped by heat; temperatures are below-normal for a large part of North America and parts of Eurasia. 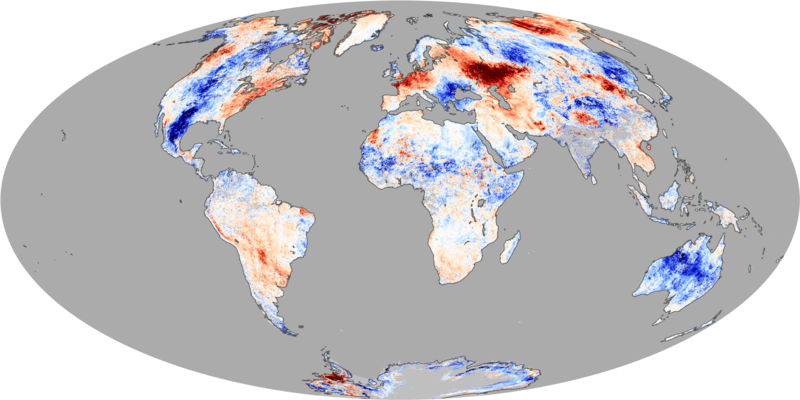 Because this image shows temperature anomalies rather than absolute temperatures, not all red areas are warmer than all blue areas. 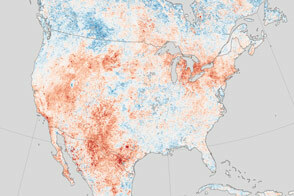 Red-hued northern Canada, for instance, is not warmer than blue-hued northern Mexico. Although deep red tones predominate along the mid-Atlantic coast, absolute temperatures are probably warmer in the barely orange American Southwest. Unusually warm conditions predominate in South America, but the Southern Hemisphere is in winter. The Earth Observatory’s Global Maps section provides an animation of monthly land surface temperatures from February 2000 to the present. Correction: This post originally stated the early July 2010 heat wave was a "global phenomenon." We have revised to make our meaning more precise: many places around the globe experienced heat waves in early July. NASA Earth Observatory image by Jesse Allen, based on MODIS land surface temperature data available through the NASA Earth Observations (NEO) Website. Caption by Michon Scott. This color-coded map shows above- and below-normal temperatures in early July 2010, when a heat wave struck much of North America and Eurasia. BBC. (2010, July 7). Heatwave causes power cuts in eastern US and Canada. Accessed July 15, 2010. Kurczy, S. (2010, July 7). Global heat wave hits US, reignites climate change debate. Christian Science Monitor. Accessed July 15, 2010. PBS NewsHour. (2010, July 7). Scorching heat wave waylays East Coast states. Accessed July 15, 2010. Rigaux, P. (2010, July 8). Frederick remains mid-Atlantic hot spot. Accessed July 15, 2010.